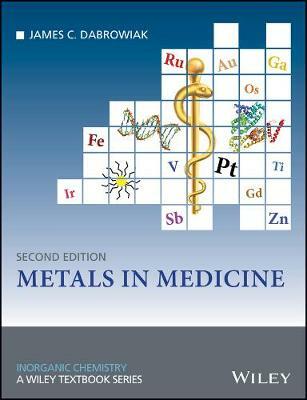 Working from basic chemical principles, Metals in Medicine 2nd Edition describes a wide range of metal-based agents for treating and diagnosing disease. Thoroughly revised and restructured to reflect significant research activity and advances, this new edition contains extensive updates and new pedagogical features while retaining the popular feature boxes and end-of-chapter problems of the first edition. Topics include: * Metallo-Drugs and their action * Platinum drugs for treating cancer * Anticancer agents beyond cisplatin including ruthenium, gold, titanium and gallium * Responsive Metal Complexes * Treating arthritis and diabetes with metal complexes * Metal complexes for killing bacteria, parasites and viruses * Metal ion imbalance and its links to diseases including Alzheimer s, Wilson s and Menkes disease * Metal complexes for detecting disease * Nanotechnology in medicine Now in full colour, Metals in Medicine 2nd Edition employs real-life applications and chapter-end summaries alongside feature boxes and problems. It provides a complete and methodical examination of the use of metal complexes in medicine for advanced undergraduate and postgraduate students in medicinal inorganic chemistry, bioinorganic chemistry, biochemistry, pharmacology, biophysics, biology and bioengineering. It is also an invaluable resource for academic researchers and industrial scientists in inorganic chemistry, medicinal chemistry and drug development.